In the past couple of weeks I have experienced more life altering milestones than any sane person should ever submit themselves to. My dietetic internship and 5 long years of post secondary education came to a close, I packed up my life and moved from Grande Prairie back to Edmonton after living in the snowy north for four months, I moved in with my boyfriend, Alex and therefore adopted a puppy by default, and I started my first “real” job with NAIT Food Services. Needless to say I was in need of a serious catch up with my best friend, Janelle, and a soon-to-expire groupon led us to The Dish and The Runaway Spoon (which we have both lived across from for a whole year without ever making it in to). I was pleasantly surprised to see a “You’ve Gotta Eat Here” poster, as John Catucci came for a visit last May to film an episode for Season 2 of his series. It MUST be good if it’s on the food network!? 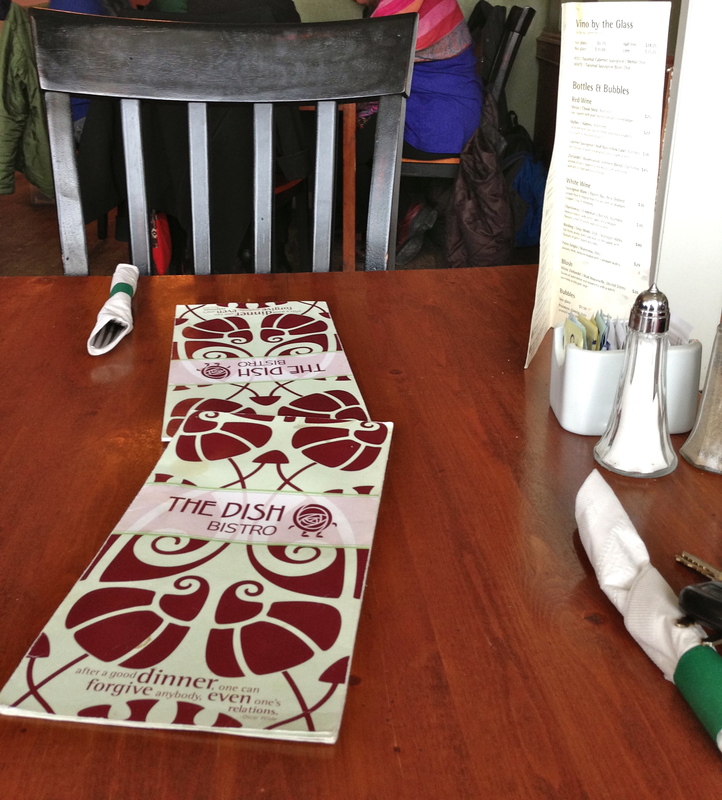 I was the first of my twosome to arrive and I was seated at a quaint table within the 40 seat bistro. After a lot of chatting and very little focus spent on the menu, we decided to share the Curried Turkey Burger and the Sticky Orange Chicken. The service was quite casual which worked well for the intense gossip that was going on at our table but may not be ideal for all circumstances. This curried turkey burger came with a citrus fennel and apple slaw which had the perfect balance of acidity, richness, and crisp and a side of fresh root vegetable chips that gave me the kick of salt that I look for in any meal. The burger itself was extremely flavorful and moist, but the bun seemed soggy to me (likely from the aoili). I would definitely order this again and I may have even been upset that I didn’t get to eat the whole thing by myself! 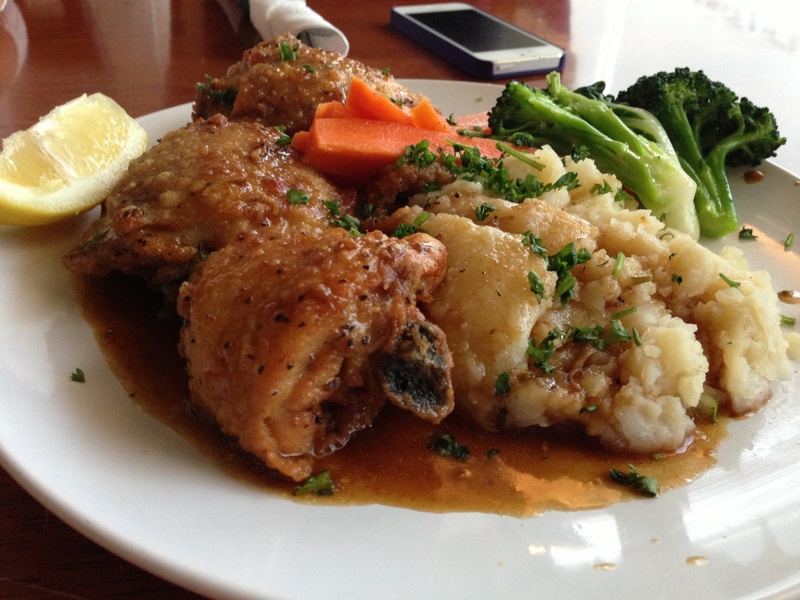 The chicken came with chive and garlic mashed potatoes and seasonal vegetables and it looked amazing! I’m not sure if it’s the dietitian in me but I was a tad disappointed to see chicken thighs rather than chicken breasts..I just can’t stand a soggy, fatty chicken skin. I was expecting a punch of citrus from the chicken and it left me wanting. Still looking forward to their appearance on the next season of “You’ve Gotta Eat Here” and wouldn’t be opposed to giving it another shot, but my socks were not knocked off. 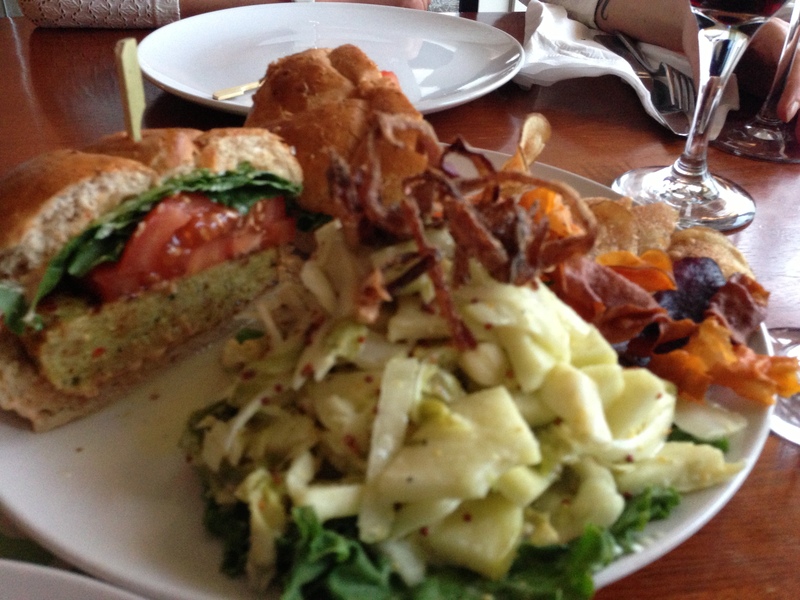 This entry was posted in Restaurants and tagged Chicken, Dish, Edmonton, John Catucci, Root Vegetable Chips, Turkey. Bookmark the permalink. Awesome site can’t wait for more.